Heavy-gauge steel wire belts are arranged in the optimum configuration to provide long wear and excellent belt durability. A full-width transition belt promotes even treadwear from shoulder to shoulder. 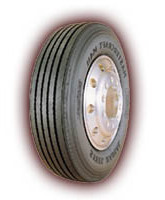 Two load belts provide a rigid platform under the tread to maintain the tire's dimensional stability and improve wear. A protector belt adds support under the tread and protection for casing from damage due to stone penetration.